Make money in your own home-based business -- unlimited income potential. Work your own hours running an exclusive CityUSA city guide for your town or city. Get started for only $49/month (no setup fees and no contracts). One of the best online business opportunities on the web. This business features a business directory unequaled by any business directory sites. A proven home business opportunity! 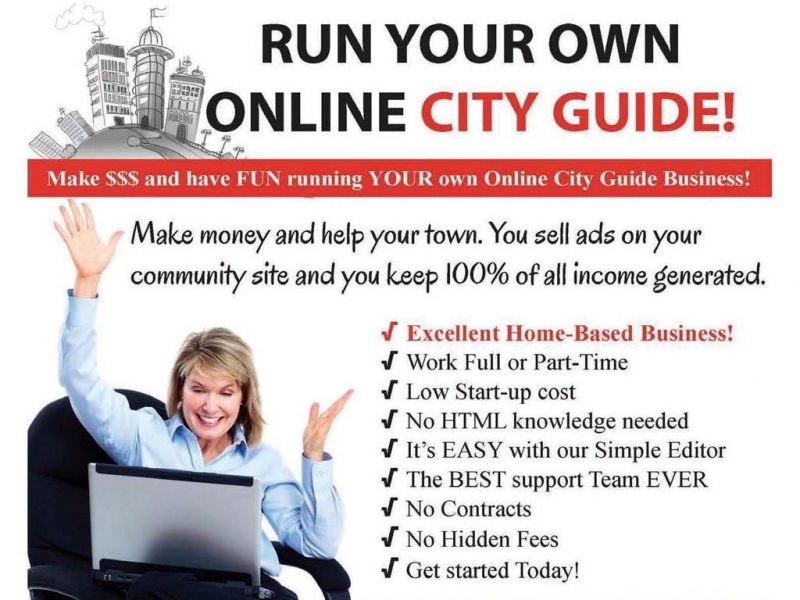 Your own website and turnkey internet business set up and ready for you to run your City Guide! CityUSA. Make money. Work at home selling local businesses listings and advertising on your site. You set your own pricing and you keep 100% of your income. Your online directory comes ready to sell advertising to local advertisers! Easy to use software. You don't need to know web design or programming! Running you online city guide is easy! We even create a complimentary Custom Header for your new site! Make money from home part time or full time running your own business directory, city directory, and Internet business. Your CityUSA home business opportunity is the ideal home based business. Online city guide with easy-to-use software. No web design or programming knowledge needed. If you can use MS Word you can easily manage this business using our online WYSIWYG (what you see is what you get) editor software. Provide Internet presence to businesses without websites. We lease only one online cityguide site per city- Is your city still available? As a site owner with CityUSA for several years, I can attest that what you see is what you get when you signup. CityUSA provides excellent customer service and it is very refreshing to deal with a company where there are no surprises and no hidden costs. Idette, NY City is.. I love this opportunity with City USA! I love this opportunity with City USA! With the economy and job market the way it is now, I had to find a new source of income. Start up is affordable and they are always looking for ways to improve the sites. Just wanted to let you know how pleased we are with our CityUSA website! The results have really exceeded our expectations. We are averaging 10 to 20 new advertisers per week! Thank you for creating such a great opportunity! Support Comments: Marketing, technical, online, meetings and ongoing support. Additional Listing Comments: Territories are limited so contact us today to see if your area is open!